This account has not done any sort of duping/gems selling and violate to Auction House and i have the transactions logs to proof it, My friend trade me free gold for 30bill before he quits and i didn't realized until the trade is completed that i have received 300bill instead I have played diablo since the very first day and there were no commas on trade menu and i have suggest this issue but none of the blues ever reply so i don't think i should take the blame. 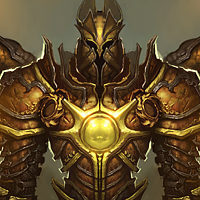 On your last replyed ticket said " An additional review of the action taken against the Diablo III account on xxxxxxxx@hotmail.com has been completed. We have confirmed our initial findings, and the account action will not be reversed or changed. " so what exactly that you have review? and whats the finding? please explain, we consumer/players have the rights to know and we DID rightfully pay $59.99 usd for the game and now you can just banned anyone to your liking? I deserve to know what i did wrong. Im sure this thread won't be here long but if anyone experience the same problem post here. Blizzards TOS allows them to do just about whatever they want whenever they want. If you don't like it, then get a lawyer ? anyone got any other links? BLIZZARD MAY SUSPEND, TERMINATE, MODIFY, OR DELETE ACCOUNTS AT ANY TIME FOR ANY REASON OR FOR NO REASON, WITH OR WITHOUT NOTICE TO YOU. Sounds like Blizzard. Not like we have the power to do anything. I won't be purchasing another copy from Blizzard again. D3 is a failure and with each patch, it kills the game even more. So you're friend received 300b from a friend who was quitting....we're not that stupid, nor is Blizz, Are you posting from a mule acct? hmmmm? I might need to buy a mule account... is that against the TOS? Ban's player who barley did the dup and lets people who got billions keep it sound's like blizzard to me. Did he try and roll back his account after giving you 300 billion by any chance? Maybe thinking it was a hacker who stole all his gold? Did he get his gold from the recent AH exploit? I have seen threads in the past about people getting banned over roll-back requests where they are thought to have been trying to dupe gold. The typical case of these were X gives gold to Y, X knows Y as a "friend" and then X requests roll-back shortly afterwards to time before X gave gold to Y because he was "hacked". Gold is not account bound when restored via a roll-back so they still have to be careful when rolling back accounts to prevent people duping gold. So... it seems pretty much like if you sold for real $ on the day.. you got banned and blizzard confiscated[Stole] your sales. I suspect this all all a setup, they let the dupers do all the dirty work for them so they can profits in between, think about it what is there to lose on Blizzard side and there were no such bug in PTR so why in live server? This bug went on for hours which blizzard can stop it almost immediately or 1-2hrs but why let it sits that long? Now all real money are missing, assumes 50cents from each account how much would it it be in total? You really aren't that smart are you ? It's the same way they track stolen money in the real world, by following the transaction logs. It's not terribly hard. Just buy the game again, set up another email account and make Blizzard some more money ? I was banned for selling a large amount (224) gems, which were purchased with $182.30 of Blizzard balance. So even though I didn't dupe, it seems simply buying and selling a large amount of gold was enough reason for Blizzard to ban me. On that note, I've actually sold gems MANY times for gold in the past whenever I needed to convert RMAH balance to gold. So it seems this was simply because a dupe that I didn't even know about was going on. I figured the reason gems went from 20-25m to 80-90m was due to the change in the gold price, but apparently it was due to duped gold. What may have made it worse is that I sold the 224 gems in batches of about 10-20, so I probably got duped gold from like 15 different players, rather than from 1 person. TBH I don't feel that should be a ban-able offense though, since it's not like I even knew there was a gold dupe. If gems suddenly changed price without the price of gold changing so much, it would have added enough suspicion to question what is going on.